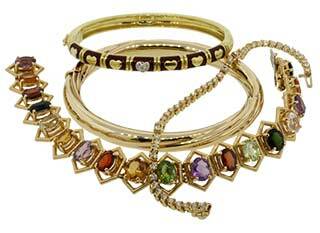 That gold necklace or chain around your neck is worth big bucks! Solid yellow or white gold chains can easily contain an ounce or more of gold, and that adds up to big money! 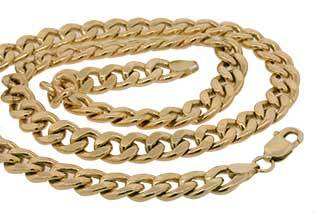 We buy all gold chains, necklaces, chokers, Omega necklaces, and any other type of necklace or chain you can think of. As long as it is made of solid gold, you will get cash for your gold chain. Old school men’s heavy Figaro, Gucci, Curb link and rope style chains can even contain three to five ounces of gold and can bring thousands of dollars. The chain pictured on the left is a very heavy mens gold chain weighing 5.5 troy ounces of 14k gold! With gold at $1300 per ounce, this chain would be purchased for almost $3400! Perhaps you don't have a chain this big and heavy but even a few regular sized chains or necklaces can add up to big bucks! As long as it is made of solid gold, you will get cash for your gold chain. Old school men’s heavy Figaro, Gucci, Curb link and rope style chains can even contain three to five ounces of gold and can bring thousands of dollars! Stay up to date by checking the current price of gold on the left. The price of gold topped $1900 per ounce a couple years ago. Since then prices have dropped into the $1300 range as of April 2014 but the price could easily shoot up again beyond $1900 in the future. Its a good idea to stay up to date on the current price of gold so you can understand the value of your gold chain and other gold items. Be sure to sell gold necklaces and chains to Cook County Buyers if you want the most cash for your gold. 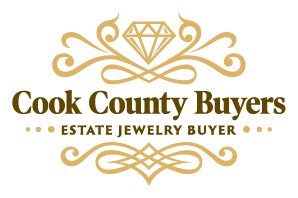 If you are ready to sell a gold chain or necklace, please give Cook County Buyers a chance to earn your business. We are ready to pay you more for your gold than most other buyers and have several options for selling your gold. You can make an appointment at the Skokie office, or choose to meet at a restaurant or coffee shop near you.